Depending on the travel arrangements you made before the trip, during the next four days you’ll be doing one of the following: hiking the Classic Inca Trail, hiking the Inca Quarry Trail or staying in Cusco for another two days before taking the train to Aguas Calientes. While away from Cusco, the bulk of your luggage will be stored at your hotel. If you’re hiking the Inca Trail or the Inca Quarry Trail, the evening before you leave Cusco you'll receive a small duffle bag to carry your clothes in for the next four days (5 kg maximum). Your team of porters will carry these bags for you, together with the food and equipment for the trail. Please note that you won't have access to these items until the end of each day, as the porters will always be ahead of the group. If you’re travelling to Aguas Calientes by train, you'll be able to leave most of your luggage at the hotel in Cusco and only travel with the necessary items during the excursion by train. Route 1 Classic Inca Trail: Today travel by minivan to the 82 kilometre marker and meet your crew of local porters, cook and guide. The first day includes uphill trekking to the campsite, which is at 3100 metres above sea level. On the way you’ll see the Inca sites of Ollantaytambo, Huillca Raccay and Llactapata, as well as incredible views of snow-capped Veronica Peak. In the evening, unwind at the campsite with a nourishing meal. 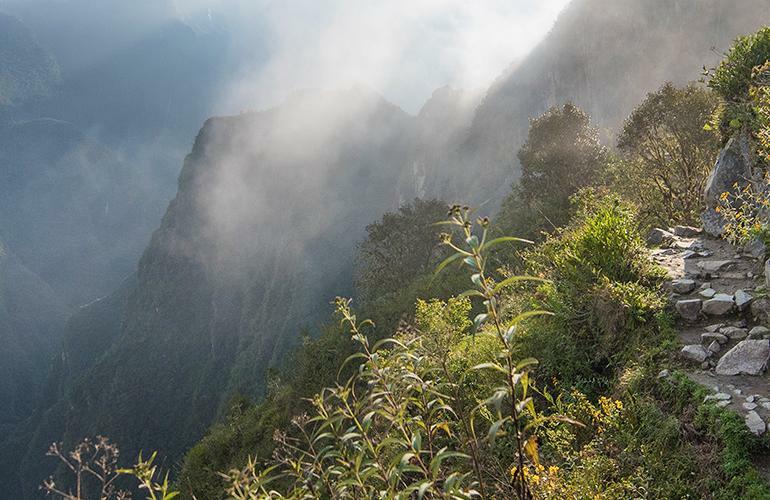 Note: The Inca Trail is within the abilities of most reasonably fit people, but please come prepared, as the trail is 45 kilometres long and often steep. Each day's journey generally consists of seven hours of walking (uphill and downhill), with stops for snacks and lunch. Trekking usually begins at 7 am (except on the fourth morning) and you reach the campsite around 5 pm. Accommodation on the trek is camping (three nights). Double tents (twin-share) and foam camping mats will be provided. The porters will set up the tents while the cook prepares meals. Route 2 Inca Quarry Trail: Make an early start today and drive to Choquequilla, a small ceremonial place where Incas worshipped the moon. Drive to the starting point of the trek, Rafq'a, and meet the horsemen who join us on the hike. After an hour’s walk, reach the small community of Socma. Carry on to the Perolniyoc cascade lookout, an opportunity to stop for photos and a food break. Continue to the campsite, which is 3700 metres above sea level. You should reach the campsite around lunchtime. After lunch, set off to explore the Q'orimarca archaeological site, which once served as a checkpoint to the Incas. Note: The Inca Quarry Trail is within the abilities of most reasonably fit people. The hike is 26 kilometres long in total and its highest pass is at 4450 metres above sea level. Throughout the trek, horses will carry your gear and camping equipment. The first two nights are spent camping and the third night you will stay at a simple hotel. Double tents (twin-share) and foam camping mats will be provided. The porters will set up the tents while the cook prepares meals. Route 3 Train: After spending the night in the Ollantaytambo, leave around 9.30 am and take a short drive to the town of Pisac. Pisac is well known for its market. Here you’ll have the opportunity to shop for souvenirs and perhaps try some local Empanadas. Arrive back into Cusco in the afternoon, where your leader will take you to San Pedro Market in order to buy some things for a picnic tomorrow. Notes: Included lunch and dinner on this day is for people trekking the Inca or Inca Quarry Trail only. 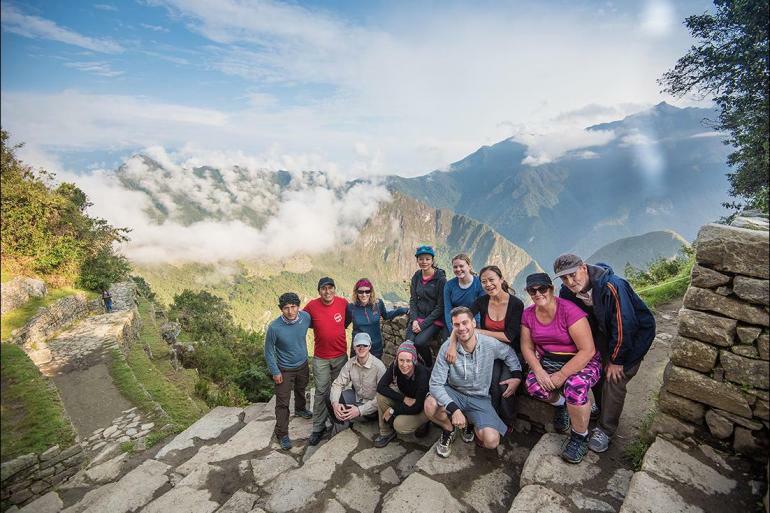 Route 1 Classic Inca Trail: This is the most challenging day of the trek as you ascend a long steep path (approximately five hours) to reach the highest point of the trail. Colloquially known as 'Dead Woman's Pass', Warmiwanusca sits at a height of 4200 metres above sea level, providing amazing views of the valley below. The group will then descend to the campsite in the Pacaymayo Valley at 3650 metres. Route 2 Inca Quarry Trail: This is the most challenging and rewarding day of the hike. A three-hour walk takes us to the top of the first pass of Puccaqasa (approximately 4370 metres high). After enjoying picturesque views of the valley, it’s a short walk before stopping for lunch. Afterwards, make the two-hour hike to Kuychicassa, the highest pass of the trek at 4450 metres. From here, descend to the sacred site the Incas called Intipunku (Sun Gate), with views of the Nevado Veronica mountain. Head to the campsite, only a stone’s throw away at Choquetacarpo. Route 3 Train: Today, take a taxi to Tambomachay, an archaeological site just outside of Cusco. From here you’ll take a short downhill walk (between one and three hours) back to Cusco. On the way, stop to admire some of the archaeological sites, including Puka Pukara, Qinqu Quenqo and Saksaywaman. Arrive back in Cusco in the afternoon and enjoy some free time to go shopping, or perhaps visit Merida, Mendivil and Olave art galleries and workshops. Your tour leader will be able to give you some suggestions or point you in the right direction. Notes: Included lunch and dinner on this day is for people trekking the Inca or Quarry Trail only. Route 1 Classic Inca Trail: Start the day with a climb through the Pacaymayo Valley to Runkuracay pass (3980 metres). Enjoy views of the snow-capped mountain of Cordillera Vilcabamba before descending for around two to three hours to the ruins of Sayacmarca. Continue over the trail’s third pass to the ruins of Phuyupatamarca (3850 metres), also known as 'Town Above the Clouds'. Start the two-hour descent down the Inca steps to the final night's campsite by the Winay Wayna archaeological site. Route 2 Inca Quarry Trail: Today’s hike will all be downhill. The first stop is the incomplete Kachiqata quarry, where the Incas were intercepted by the Spanish. Around midday, come to the end of the trek. Explore the cobbled streets of Ollantaytambo before taking the short train journey to Aguas Calientes. This is where you’ll meet up with the travellers in your group who didn't hike. Visiting the natural hot springs in town is a soothing way to spend the late afternoon. Spend the night in a comfortable hotel before tomorrow’s visit to Machu Picchu. Route 3 Train: After a drive to Ollantaytambo (about one and a half hours), catch a train through the winding Urubamba Valley to Aguas Calientes (another one and a half hours). The city is nestled in the cloud forest at the foot of Machu Picchu. For those who want a sneak peak, there is time to visit Machu Picchu independently before a guided tour the following day. Otherwise, you can while away the afternoon in the natural hot springs at Aguas Calientes. Notes: Included lunch and dinner on this day is for people trekking the Inca or Quarry Trail only. Route 1 Inca Trail: This is the final and most spectacular leg of the trek to Machu Picchu. The day starts before dawn with breakfast at 4 am. Say farewell to the porters as they descend to the train station and then begin hiking by 4.30 am. One the final checkpoint opens at 5 am, begin the final leg of the trek. The walk to Intipunku (the Sun Gate) takes around two-and-a-half hours. Weather permitting, enjoy unforgettable views over the ‘Lost City of the Incas’ as you enter Machu Picchu through the Sungate Route 2 Inca Quarry Trail: Depending on weather conditions, take a bus at 5.30 am this morning along the winding road to Machu Picchu. The journey takes around 30 minutes. At Machu Picchu, join up with the travellers in your group who hiked the Classic Inca Trail. If skies are clear, enjoy a spectacular views over the ancient city from the Sun Gate, before going on a guided walk around the ruins. Route 3 Train: Take an early bus up to Machu Picchu at 5.30 am. The city was built around 1440 AD as a country retreat for Incan nobility, but there’s evidence that the land had been a sacred Incan site for much longer. Take a guided tour around the ruins of temples, palaces and living quarters, and enjoy free time afterwards to wander around on your own before the group returns to Cusco. Visiting Machu Picchu: According to Machu Picchu visiting regulations, all visitors must follow a pre-determined route within the site. This route must be followed in one direction only and once the guided visit commences exiting and re-entering the site is not permitted. Once the guided visit concludes, visitors must exit the site and personal exploration of Machu Picchu is not permitted. For all trails - after taking advantage of the seemingly endless photo opportunities, it's time to return to Cusco for a well-deserved shower and a Pisco sour.